I chose to study and follow up on this Buddhist teacher and style of meditation because of all the spiritual disciplines, I feel that this one has had the most profound practical impact on me, despite the fact that salvation and time spent with the living, transcendent God has also been real and powerful for me. I grew up in an agnostic home, but became a born again Christian my senior year in college. Although my experience with Christ was real, positive, and powerful, the group I was involved in was spiritually abusive, living out an elitist, evangelistic, Arminian holiness faith that built a very works-based foundation in my life which I later had to unlearn. After an initial 10 years in Christianity, I was compelled to leave in order to uproot that foundation and rebuild. I explored and benefited from counseling, both secular and Christian, inner child work, masculine identity work, A Course in Miracles, yoga, and Buddhist mindfulness meditation. Mindfulness meditation taught me compassionate self-observation, which returned me to a healthy self-love, which then enabled me to invest in myself for the sake of self-giving, and in turn, I also treated others with compassion and suspended judgments. It provided tools for self-knowledge and mastery which I did not receive from my Christian faith, which was focused outwardly towards God rather than inwardly, often out of a mistaken understanding of self-love as always a selfish endeavor. To this day, I find the level of peace and equanimity that I gain from Vipassana techniques surpasses others in both its depth, and the simplicity in which one may arrive at such a state. S.N. Goenka (1924-2013), as he is commonly known, was born into a conservative Hindu family, and became a successful Burmese industrialist for most of his life. In his 30’s he began looking for solutions to the migraines that had plagued him since youth. In 1955, he met meditation teacher Sayagyi U Ba Khin and became his student. U Ba Khin taught him the non-sectarian awareness meditation technique known as Vipassana, and his life was transformed by this newfound practice. He continued to study under U Ba Khin, and in 1969, became an authorized teacher of Vipassana. In 1976 he moved to India and began teaching the technique, which attracted thousands, including westerners. Being a layman with a large family, and not a monk, he became known for his practical and accessible teachings, and the non-sectarian and generalized use of Buddhist terms won him fans among senior monks in Burma, India, and Sri Lanka. He began holding his now well-known 10 day silent retreats, and began opening retreat centers, which now span 20 centers worldwide in 94 countries, including 17 centers in the U.S. In 2000, he laid the foundation of the 325 foot high Global Vipassana Pagoda in Mumbai, which took 11 years to finish. 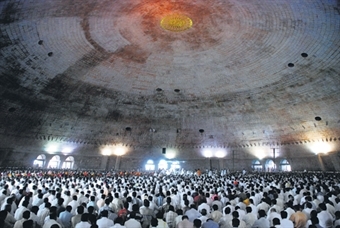 The dome is 90 feet in diameter, can seat 8000 people, and is one of the largest pillar-less domes in the world, thanks to the inter-locking stones used in construction. Of note is the implementation of Vipassana meditation among prisoners in India which led to some breakthrough reforms and a well received 1997 documentary entitled Doing Time Doing Vipassana. 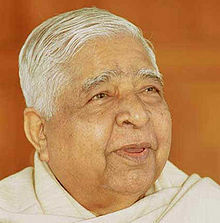 Goenka has lectured and written in both Hindi and English, and was active in meditation teaching until his death of old age in 2013 at 90 years old. Vipassana claims to be a pure teaching of the meditation techniques of Siddhartha Gautama, also known as Buddha. As such, it emphasizes that it is a purely empirical method, and that all truth must be experienced, rather than believed intellectually or based on the authority of another. Do not simply believe whatever you are told, or whatever has been handed down from past generations, or what is common opinion, or whatever the scriptures say. Do not accept something as true merely by deduction or inference, or by considering outward appearances, or by partiality for a certain view, or because of its plausibility, or because your teacher tells you it is so. But when you yourselves directly know, â€œThese principles are unwholesome, blameworthy, condemned by the wise; when adopted and carried out they lead to harm and suffering,â€ then you should abandon them. And when you yourselves directly now, â€œThese principles are wholesome, blameless, praised by the wise; when adopted and carried out they lead to welfare and happiness,â€ then you should accept and practice them. Vipassana is founded on the idea that we suffer because of our inward cravings and aversions, and that our subconscious reactive thought patterns cause us to persist in attitudes and behaviors that cause us to suffer. Vipassana is a type of awareness meditation that follows, among other frameworks, the Buddhist Noble Eight Fold Path (NEP), by which Buddhism teaches we can escape these cravings and thought patterns, and thereby escape suffering. The word Vipassana means â€˜insight,’ or â€˜to see things as they really are.’ Focused periods of silent sitting, being non-judgmentally aware of one’s physical sensations and related inner thoughts promises to take participants on an inner journey of awareness, dissolving suffering, and the releasing of happiness, which is our true state. Vipassana aims to help us change the steps I have darkened above, Perception and Reaction. Consciousness is merely the part of us that becomes aware of some phenomenon. However, via our perception, the act of recognition occurs, and we assign labels, evaluations, and positive and negative meaning to the sense or thought input we are experiencing. Of course, we may misperceive or poorly evaluate what is happening to us, yet now know it. Interestingly, before we act, there is another step, that of sensation. All phenomenon, whether they originate from the outer world or our inner landscape, after the interpretation of perception, are translated into an emotional and physical sensation. This is how physical reaction is initiated from our sense experience and input. And if we are not conscious of or in control of our inner thoughts and habits, we then react, often without thinking. Vipassana aims to raise our awareness of this inner process, and teach us how to both delay reaction until after conscious thought, and choose a response rather than a reaction. Sila (morality) is the first of three stages in Vipassana, incorporates the first three of the eight stages of the Noble Eightfold Path (NEP), and can be called the discipline of moral practice. During a 10 day retreat, and hopefully in life, Vipassana asks the practitioner to lay a moral foundation of moral living in order to calm the waters of the soul through abstention from all unwholesome actions of body and speech. In terms of the NEP, this stage involves right speech, right action, and right livelihood. â€¦telling lies, that is, speaking either more or less than the truth; carrying tales that set friends at odds’ backbiting and slander; speaking harsh words that disturb others and have no beneficial effect; and idle gossip, meaningless chatter that wastes one’s own time and the time of others. Of course, beyond our speech, our actions must engender peace and tranquility within. According to Vipassana, we must also abstain from killing any living creature, stealing, sexual misconduct, and intoxicants. And such practices are heightened during retreats, where, for example, abstaining from sexual misconduct is elevated to celibacy during the entire retreat. Both Buddhism and Vipassana recommend that we not be involved in any livelihood that causes suffering or violates the principles of right speech and action in the lives of others, either directly or indirectly. This means not trafficking in intoxicants, weapons, the death of animals (including selling or preparing meat) or dishonest work. Of course, at a 10 day silent retreat, you have no chance to engage in wrong or right speech, since you are silent. But you do have the choice to act without harming others, and entirely vegetarian meals are served throughout the retreat. And since you are not working, and not paying for your stay, your livelihood is not involved (all retreats are free). Samadhi (concentration) is where the breath-centered silent meditation of Vipassana begins. It entails three more of the NEP stages, that is, right effort, awareness, and concentration. The main purpose of this beginning step is to begin the process of consciously controlling the attention of the mind. At this stage, nearly all students find their mind wandering rapidly and constantly (this phenomenon is often called â€˜monkey mind’), and the student begins to see that they not only have poor control over their mind, but deeply ingrained and recurring thought patterns. Another important part of this discipline is to dispassionately observe your own thoughts from a third person point of view, not judging, fixing, or even holding on to the thoughts, but releasing them and returning focus to the breath. Already at this early stage, the student is practicing non-reactivity and detachment from sensory and thought inputs. This is how the student first learns to practice non-reaction, equanimity, and feeling without acting on their perceptions or interpretations, and in doing so, loosening the grip of their own grid of perceptions. Maintaining wholesome states without lapse. The breath, according to Goenke, is the perfect medium for focus because it bridges the conscious and the unconscious, in that we breathe unconsciously, but can also manipulate it consciously. As we focus our awareness on our breath, and let go of pesky superficial thoughts, we begin to settle into the present moment, and this awareness then allows us to begin to access the our deeper emotions and thoughts, and those that are actually stored as pains and sensations in our bodies. We are now entering into the present moment, not being preoccupied with the past or future. We now have a real chance to observe our inner reality in real time, not as we remember it or think of it. One other awareness-oriented benefit of focusing on the breath at this point is that the breath is neutral, not positive or negative, and so this focus is exercising our ability to be â€œfree from craving, aversion, and ignorance.â€ At this point, we may also encounter our inner resistance to the process in the form of doubts, anger, and other deep thought patterns. Persisting in our attention to our breath, and maintaining our awareness of our inner experience is the experience of concentration. We are building a spiritual muscle, and it is often way out of shape! Holding our own attention on the present and on our breath for hours builds a type of concentration and endurance that goes beyond holding our attention for a minute. As our experience of peace and equanimity increases in this stage, we may encounter unusual experiences like visions or lights, but these too are to be allowed to float downstream in our thoughts, they aren’t to be held on to, and are not the goal. They are just a temporary phenomenon on the road to self-awareness and liberty. Vipassana concentration is unlike other methods such as mantras, the focus of an athlete, or other repetitive disciplines. In those activities, one becomes absorbed in the object of attention, and while one may reach a blissful state or trance (or enter â€˜the zone’), these techniques are only touching the surface of the mind, while the depths of one’s thought conditioning are typically largely unseen or untouched. Because breathing is automatic, the attention is not split between maintaining the activity and focusing on it, there is only one focus, and this allows the Vipassana student to pass beyond the breath into the interior of their own soul. While the first two stages alone can lead to improvement, they are not the goal of Vipassana, which is paÃ±Ã±a (wisdom). In themselves, morality and concentrationâ€¦are valuable, but their real purpose is to lead to wisdom. It is only in developing paÃ±Ã±a that we find a true middle path between the extremes of self-indulgence and self-repression. By practicing orality, we avoid actions that cause the grossest forms of mental agitation. By concentrating the mind, we further calm it and at the same time shape it into an effective tool with which to undertake the work of self-examination. But it is only by developing wisdom that we can penetrate into the reality within and free ourselves of all ignorance and attachments. At this point, practitioners no longer merely focus on the breath, but having learned to martial their focus, now scan the bodily sensations slowly, from head to foot and back again, observing their physical or emotional sensations. It is at this point that real wisdom begins to reveal itself, and old patterns of thought and emotion begin to appear and dissolve just by being seen. The remaining two parts of the NEP are now employed, namely right thought and understanding. By this point, the practitioner is relatively free of extraneous and superficial thoughts, and has developed the ability to resist reacting to every stimuli. They have learned to sit quietly and not scratch an itch, or kill a mosquito. They are now free to choose the focus of their thoughts. But rather than now providing â€˜right’ thoughts to dwell upon, the process of impartial observation now has a strange effect, reality begins to arrange itself for us as it really is, not as we understand or perceive it. Having become more perfect observers, we are privy to the secrets of our inner and outer world revealing their own wisdom to us. This is what is meant by â€˜Vipassana’ or â€˜insight.’ We begin to see ourselves more honestly, and we begin to have what many consider flashes of insight as the true order and reality of things begins to enlighten us. These insights may be small, but understanding comes more quickly when we are more attuned to experiencing wisdom instead of just knowing it in our heads. Goenke explains that there are three ways to get wisdom, and that Buddhism stresses really only one kind, that of experience. We may learn wisdom from (a) intellectual observation, or from (b) some spiritual authority (such as sacred writings or elders), but in the end, what makes for real wisdom, according to Goenke, is (c) experiencing the reality of wisdom in our own lives. This emphasis on empirical knowledge of the inner and numinous is both a strength and weakness in Buddhism. Its strength is its honesty and integrity, we do not proclaim or even follow that which we have not personally tested. The weakness is we may limit ourselves to the wisdom we understand, have experienced, or can verify. Vipassana is one of the treasures I brought back with me from my 8 year hiatus from Christianity. I still practice it as one of my tools of prayer, and the benefits I get from it include freedom from the inner critic, lengthened response times, and equanimity. One of the natural faults of fallen humanity is that we are very critical, especially those of us who are victims of an overly ambitious and competitive society. In fact, this emphasis on rational, critical analysis has forced us to develop a method for stymieing the critic in meetings where ideas are needed, and that method is called â€˜brainstorming.’ In it, we agree, for the time being, to not evaluate or criticize any idea, no matter how ludicrous it might at first seem. This allows every possible idea to emerge unhindered. Later, we can bring back the critic to evaluate our ideas. But if the critic were present from the start, many ideas would remain hidden due to fear of rejection or reprisal. Quite honestly, our own spirits are like that. For many of us, observing our inner thoughts without evaluating or fixing them is a very difficult but liberating discipline. One of the best skills I’ve learned from Vipassana is the ability to not immediately react to stimuli or events, and in doing so, giving myself the time to choose my response instead of unconsciously react. Of course, I don’t do that perfectly, but now in an argument, or when a child disobeys, I can access what wisdom I have and choose the response that I want, not just the one that my feelings immediately urge. This helps me de-escalate conflict, and choose to love others instead of defend myself. Vipassana strengthens my ability to choose peace on the interior when the exterior may seem chaotic. Along with the practice of yoga, I have learned how to be at peace even in tension, and this learned equanimity, gained in part through distancing myself from needing a certain outcome, has given me great peace. And even in my time with God, I have found the same lesson taught in another way, God wants me to be satisfied with Him in my inner experience, in part so that I don’t depend on external achievement or pleasures to be content. To me, equanimity and contentment are two facets of a gem, that of valuing the eternal over the impermanent and transitory. Two remaining questions are worth exploring. The first is, â€œWhy did I return to Christianity if Vipassana is so effective?â€ I had been away from Christian practice and faith for years. However, during my entire 10 day stay at the retreat, I had the distinct impression that I was where I was supposed to be, even though it was not Christian. On the tenth day of my silent retreat, having learned so much about myself and the power of Vipassana, I realized that something was still missing for me. I had practiced as instructed, as if there was no transcendent personal God to talk with. And I realized that I could not live without that, either because I needed it whether or not God was real, or BECAUSE God was real, and I was shutting that out of my experience artificially. My felt need, combined with my earlier experiences with God, and the evidence of superior human flourishing across history under Protestant faith (with exceptions) as compared to other ideologies corralled me back to faith. And I brought Vipassana with me. The second looming question is, â€œIf I think this is so valuable, how can I teach it in the Christian context?â€ While yoga can be taught as exercise, even if Vipassana is stripped of its Buddhist trappings and soteriology, teaching silence is not that easy. Sure, we have some mystical traditions, but this is markedly different from Christian meditation in that it is NOT focused on scripture or the experience of an external God, but solely on the internal experience, and focal modifications would ruin it. For now, I have decided to practice it myself and teach it to my family. I may never be able to bring it into the Christian framework. But I wish I could. William Hart, The Art of Living : Vipassana Meditation as Taught by S.N. Goenka, 1st ed. (San Francisco: Harper & Row, 1987), 1-2. “Vipassna Meditation – Locations” https://www.dhamma.org/en/locations/directory#021 (accessed 2014-12-12). 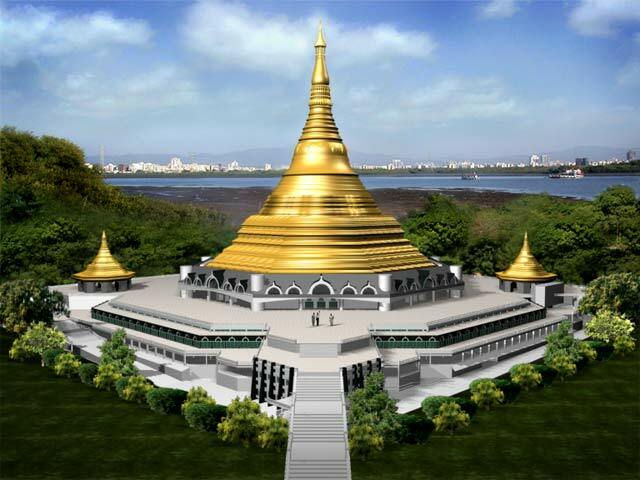 “Global Vipassana Pagoda – Facts and Figures” http://www.globalpagoda.org/facts-and-figures (accessed 2014-12-12). “Vipassana Meditation Courses in India”, Dhamma.org http://www.prison.dhamma.org/tihar.htm (accessed 2014-12-12). “Doing Time, Doing Vipassana”, IMDB http://www.imdb.com/title/tt0367665/ (accessed 2014-12-12). “Doing Time Doing Vipassana – Full Official Version (English)”, YouTube https://www.youtube.com/watch?v=WkxSyv5R1sg. “Vipassana Pioneer Sn Goenka Is Dead”, Zee News India http://zeenews.india.com/news/nation/vipassana-pioneer-sn-goenka-is-dead_880114.html (accessed 2014-12-12). S.N. Goenka, “Vipassana Meditation S. N. Goenka – 1 Day”, YouTube https://www.youtube.com/watch?v=1Ii9vjW9BwU (accessed 2014-12-12). “Saint Anselm” http://plato.stanford.edu/entries/anselm/ (accessed 2014-12-12). Thomas Anthony Harris, I’m Ok, You’re Ok; a Practical Guide to Transactional Analysis (New York,: Harper & Row, 1969). Daniel G. Sinclair, “Finding God’s Call 3, a Biblical View of Self-Love”, Wholereason.com http://www.wholereason.com/2007/08/finding-gods-call-iii-a-biblical-view-of-self-love.html (accessed 2014-12-12). Daniel G. Sinclair, “Is Man Basically Good or Evil?”, Wholereason.com http://www.wholereason.com/2010/10/is-man-basically-good-or-evil.html (accessed 2014-12-12). Daniel G. Sinclair, “Orthodox Heresies, 7 False Doctrines of the Church”, Wholereason.com http://www.wholereason.com/2012/09/orthodox-heresies-8-false-doctrines-of-the-church.html (accessed 2014-12-12).